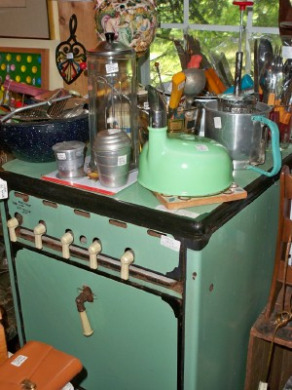 You never know just what you might find including Early American, Victorian, Art Deco, Vintage and Woodstock Memorabilia. 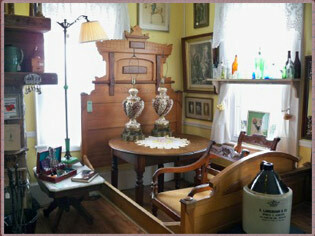 Our store features an abundance of antiques, vintage items, art and collectibles. Browse three floors of possessions in our charming 1891 house, from rustic to formal representing many different styles and periods. We specialize in victorian furniture, early 20th century furniture, 1969 Woodstock concert memorabilia, costume jewelry, sterling jewelry, american pottery and artwork from the early 1800's through the mid twentieth century. Beginning 3/29/13 we will be in a new location! We are open year round-Memorial Day weekend through Labor Day we are open Seven Days a Week; remainder of the year we are closed Tuesdays and Wednesdays. Please call for hours. We are a multi-dealer store and have a very diverse and vast inventory. 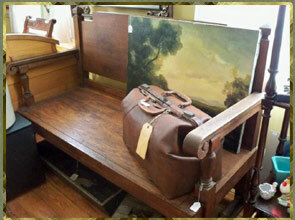 New items are frequently acquired, so plan on staying a while and visiting us often. We purchase items as well. If you would like, send us photos of the merchandise you would like to sell via email or stop by the store. We also purchase entire estates! If you would like more information on any of the items pictured, or if you would like to know if we have that special item you're looking for, don't hesitate to contact us.